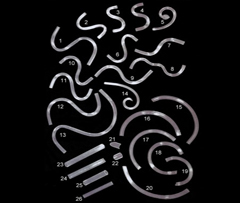 A selection of the various arm parts used in transparent chandeliers. 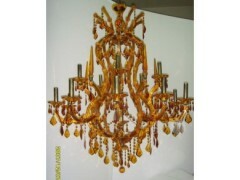 Example of a transparent chandelier with amber glass arms to match the amber crystal. Example of plain metal arms finished in bright gold. Example of a metal frame with banding and multiple suspension chains in brass. The framework of the chandelier is what holds it all together. It can be manufactured from almost any material. 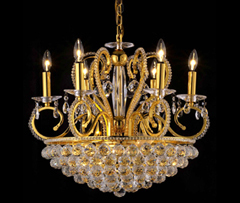 All our chandelier frames are manufactured using either high grade metal such as; wrought iron, brass, bronze and stainless steel, or silica based material such as glass, or crystal. All our frames are manufactured specifically for the chandelier in question and are formed and finished by the hands of skilled craftsmen. We do not supply mass produced machine made frames. 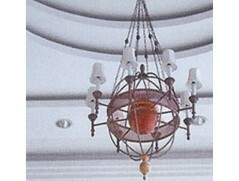 For this reason, all our chandeliers are unique, no two ever being identical.